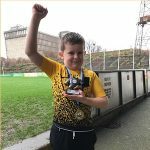 Leo & Luke’s Tribute Football Match Raises €30k!! Organised by parents Ger Grehan and Sinead Byrne to honour their son’s 💙 Leo & Luke 💙 who were born prematurely in July 2018 at 23 weeks 2 days. No weather was going to stop this game thanks to the determination of all the players, Leo and Luke certainly watched over them as the terrible weather cleared just as the players came out with the official referee’s each carrying 2 blue balloons for Leo 💙 & Luke 💙 to tremendous support and applause from the crowd. 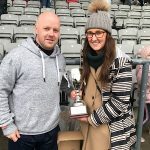 Jack Grehan’s super goal, Laurel Lodge took the trophy after defeating Villa Park 9 – 2 and were presented with the Trophy by Ger and Sinead. 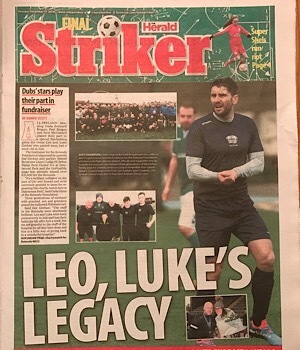 Leo & Luke also got front page coverage in The Heralds final Striker Supplement to be printed, along with the three generations of the Grehan family, Grandad, Son and Grandson who played on the Day, what a wonderful extra tribute to Leo & Luke. Ger and Sinead tell us this is the first match and they plan to hold another one this year as their way of giving back to ‘The absolutely brilliant staff of the Rotunda for all they have done’.